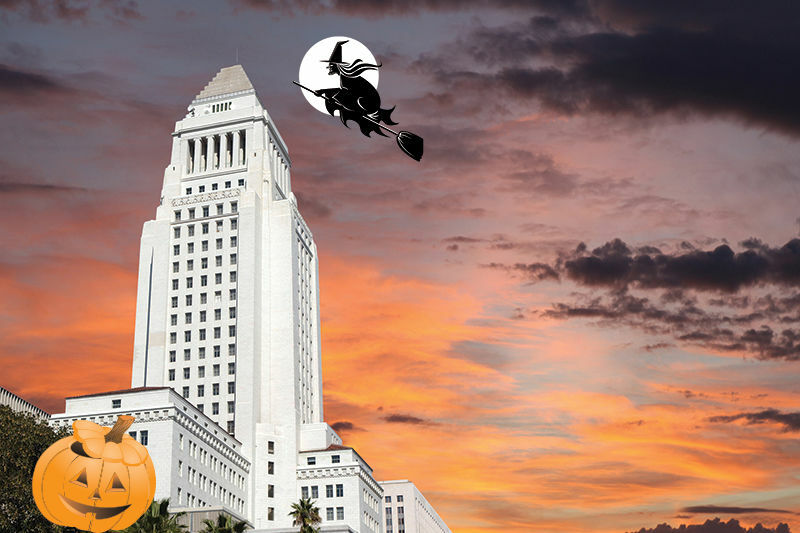 Happy Bloggin Tricks and a Special Treat, as we gladly share the 10th Annual "Happy City Hall-oween Missive", via Downtown News Editor (and "Scribe of Wit") Jon Regardie. Image above via the Downtown News (trekandshoot). ** Blogger's Note: BOOOOOO!! 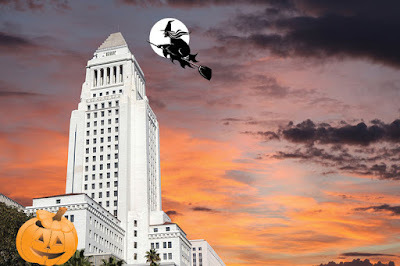 We're bloggin back on this day of Tricks, Treats ............, and the 10th Annual "Happy City Hall-oween Missive", via the mystical keyboard of Downtown News Editor (and reigning "Scribe of Wit") Jon Regardie. Surely, there are some who thought (wrongly) that we have gone away to a cyber-afterlife, but rest assure in knowing that Spirit and Body are recharged after a brief break. Below, we post an excerpt from this year's Regardie's Parody. Plus, we offer our own creative offerings on costumes for selected cronies of the local political community----Scott Johnson. 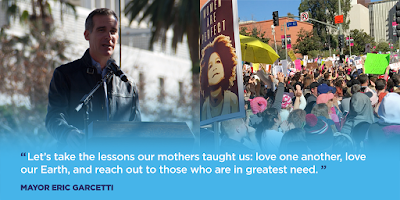 Los Angeles Mayor Eric Garcetti used a Tuesday Noontime Sacramento Press Club Event to opine on various issues, including a repudiation of Disgraced Hollywood Producer Harvey "Pervy" Weinstein, as he divest his past 2013 Weinstein Contribution, into a donation to the Downtown Women's Center. Mayor Gar-SOFT-ee's comments at the "Liberal Women's March". ** Blogger's Notes: In an exercise of bloggin objectivity, we grant equal coverage to LA Mayor Eric Garcetti's Sacramento Press Club Noon-time comments yesterday, which in part included a denunciation of DISGRACED Hollywood Producer Harvey "Pervy" Weinstein. Unknown to the Mayor Sam Blog as we were keyboarding our Exclusive on the past Garcetti and Pervy Weinstein Connection, the upwards-aspiring Politico was using a Sacramento Road Trip/Q & A Event to build Brand Recognition ..........., and condemn "Pervy" Weinstein. As the Hollywood Entertainment Complex confronts its inner-hypocrisy regarding its past "Absence of Condemnation" as exampled by the repugnant behavior of Uber Pervy Producer Harvey Weinstein, we disclose Mayor Eric Garcetti's past "monetary connection" to the disgraced Indie Movie Mogul. 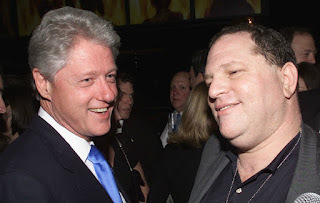 A Younger Pervy Weinstein (right) with former Impeached President Bill Clinton. ** Blogger's Notes: As top Democrat Party Leaders across the Nation are forced (again) to jointly-confront with the Hollywood Entertainment Complex, their mutual, inner-hypocrisy regarding the sexist, demeaning Treatment of Women, as exampled by Uber Pervy Mega Producer Harvey Weinstein ......., a certain Entertainment City Mayor remains silent. 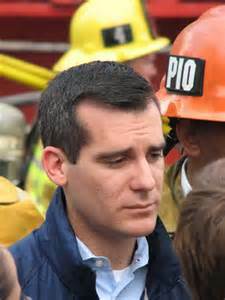 In 2013, a then Los Angeles Mayoral Candidate Eric Garcetti was competing with challenger Wendy Greuel for the Big Money Affections of the Hollywood Entertainment Complex, as both were engage in their Battle Royale to replace termed-out Failure Mayor Antonio Villar (formerly raigosa). A major coup for the Garcetti Campaign, was the support of Indie Movie Producer Harvey Weinstein, who had benefited many Democratic Campaigns with his "Bundling of Campaign Contributions". But as the DISGUSTING details of his uber-sexist behavior become public, many recipients of Pervy Weinstein's contribution largess are dis-investing themselves of all past connections to the latest "Crisis of Hypocrisy", afflicting the allied Democratic/Entertainment Industry ............., with the EXCEPTION of a part-time Thespian Mayor-----Scott Johnson. Mayor Sam Exclusive: CADEM Establishment Rigging State Party Endorsement in 51st Assembly District Runoff Election? In a Mayor Sam Exclusive, we have learned that the California Democratic Party will be hosting a "51st Assembly District Post Primary Endorsing Caucus" tomorrow (Saturday) in East LA, to allegedly, "strong-arm" the Official Party Endorsement, on behalf of the Establishment Wing Candidate of Choice ........., Wendy Carrillo. The California Democrat Party Establishment Wing Candidate Anointment Tour continues with State Senate President Kevin Alexander Leon endorsing Wendy Carrillo. ** Blogger's Note: In a Mayor Sam Exclusive, we have learned that the Establishment Wing of the Democratic Party is seeking to allegedly, "strong-arm/fast-track/rigged", the Official California Democratic Party Endorsement for supposed "Berniecrat" Wendy Carrillo .........., as THOUSANDS of ballots remain uncounted from last Tuesday's 51st Assembly District Special Election. The California Democratic Party (CADEM) will host a "Assembly District 51 Special Election Post Primary Endorsing Caucus" tomorrow morning at the East LA Boys and Girls Club (10 A.M.) and there is RAMPANT speculation that the ESTABLISHMENT wants to quickly anoint Wendy Carrillo as its candidate of choice ..........., but one problem, the election results are NOT finalized. 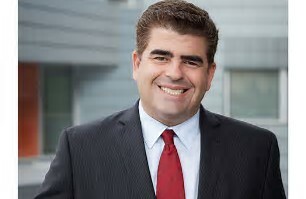 Ideally, the process of endorsing a Party (Establishment) Candidate, would be predicated on a final determination regarding who placed first and second in an election, but its been an open secret that the Local Labor-controlling Machine within the Establishment Wing of the FRACTURED California Democratic Party, has been fronting Carrillo. That stated, the Los Angeles County Registrar Recorder will be updating its Election Count today at 1 P.M. ........, but don't bet against an Establishment Machine in regards to delaying the anointment of its choice to replace the 434th ranking Congressman Jimmy Gomez in Sacramento------Scott Johnson. 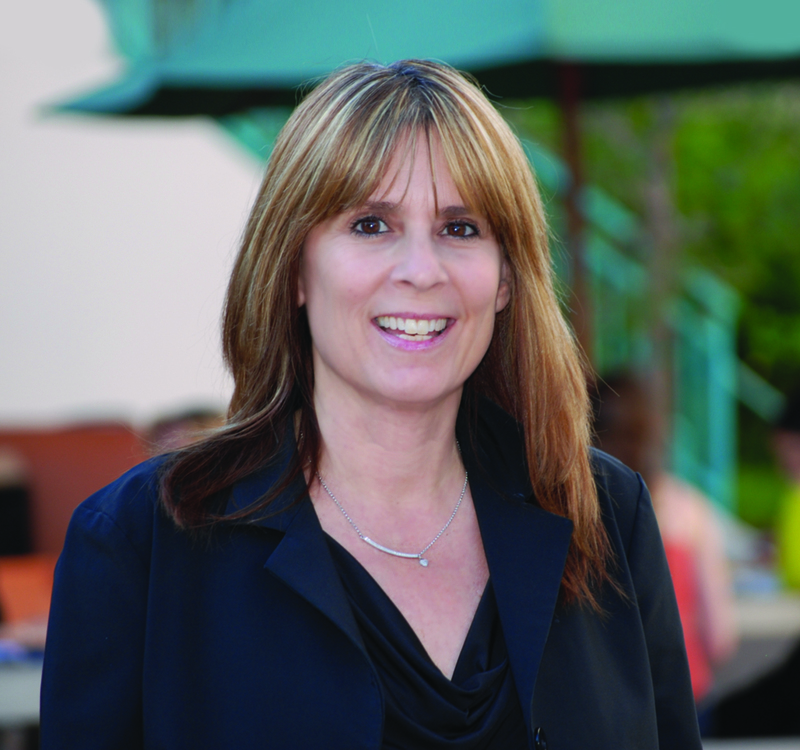 The Los Angeles Community College District (LACCD) Board of Trustees Trio of Andra Hoffman, Gabriel Buelna and State Senator Kevin Alexander Leon Staffer (by day) Steve Veres, VOTED to abstain (a NO vote) from a Resolution - in support of codifying Deferred Action for Childhood Arrivals (Dreamers) into Federal Law. Does LACCD Trustee (and State Senator Kevin Alexander Leon Staffer) Steve Veres OPPOSE legalizing Dreamers or was playing Petty Politics ......., at their expense? 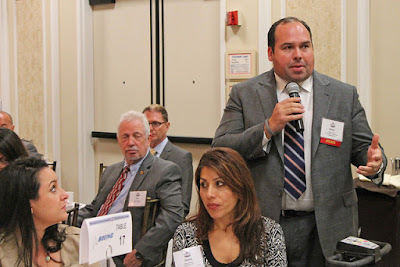 ** Blogger's Notes: There is nothing more bloggin entertaining than OUTING acts of political hypocrisy ........., especially when the two-face politicos are PUPPETS for the policy agenda of Unlawful Cubafornia State Senate President Kevin Alexander of Leon (K.A. Leon for short). Mere weeks after voting to award a mega Construction Bond Oversight Contract to the NOTORIOUS Pacific Services, the LACCD Board of Trustees Trio of Andra Hoffman, Gabriel Buelna and Steve "Pacifica Pervy Enabler" Veres ........, have AGAIN, achieve another hypocritical distinction. At last evening's LACCD Board of Trustees Meeting, the trio allegedly, played PETTY POLITICS in voting down (by choosing to abstain) a Resolution (authored by Trustees Scott Svonkin and Mike Fong), in support of codifying Deferred Action for Childhood Arrivals into Federal Law. The Resolution needed four votes to pass, but with Trustee Ernest Moreno absent due to illness, the "ABSTAINING ACTIONS" of Trustees Hoffman, Buelna and Veres, delayed a show of support for legislation that would provide legalization for 15,000 LACCD DACA Students. The Political Irony in this vote .......,is THE FACT that the lone Board of Trustee LATINO Republican Ernest Moreno, would of likely been the DECIDING VOTE in support of the Resolution----Scott Johnson. Is recently-elected LACCD Trustee Gabriel Buelna a COCONUT in regards to the aspirations of DREAMERS served by his City Terrance-based Plaza Community Services Non-Profit? Will DREAMERS call LACCD Trustee Andra Hoffman a hypocritical White Liberal for abstaining from supporting a pro DACA Resolution? Its still Unofficial, but as of Wednesday A.M. Wendy Carrillo and Luis Lopez will be the December Runoff Candidates seeking to replace the, NOW 434th-ranking Congressman Jimmy Gomez, as the 51st Assembly District Officeholder. Apparently, its TRUE Progressive Luis Lopez vs. the Establishment/Special Interest Darling Wendy Carrillo in the December, 51st Assembly District Runoff. ** Blogger's Notes: DISCLAIMER!! The results of yesterday's 51st Assembly District Special Election (with an abysmal 10% Turnout) are still unofficial, but its apparent that once again, Home-grown Candidate Luis Lopez will be facing an Establishment Challenger ........., who recently moved into the District (from Boyle Heights) Wendy Carrillo in a December Runoff. Pardon the Deja Vu Political Moment, but the upcoming December Runoff has a familiar bloggin plot line, with Luis Lopez again assuming the role of Home Grown Candidate, seeking to rebuff the Political Establishment's anointment of its chosen candidate. The Wendy Carrillo Campaign may seek to deny the assertion regarding the former Dakota Pipeline Protester, turned second-time Public Office Seeker (within weeks of her failed Congressional aspirations), that the supposed Bernie Sanders follower has gone ESTABLISHMENT. But her SILENCE regarding the BIG OIL/ENERGY/TIMBER financing of a PAC that contributed $60,000-plus to the Working Families for Wendy Carrillo Independent Expenditure Committee, is already having adverse ramifications in the Sanders-supporting Assembly District. That stated, the upcoming Runoff Campaign has a high probability to become what the preceding Congressional Campaign was NOT ............., a TRUE Progressive vs. Establishment Democrat Political Skirmish that could have a profound impact on the future of California's CONTROLLING political party-----Scott Johnson. ** AFTERNOON UPDATE: The 434th Ranking Congressman Jimmy Gomez (formerly of Riverside) has endorsed fellow Establishment Democrat Wendy Carrillo in the December Runoff. 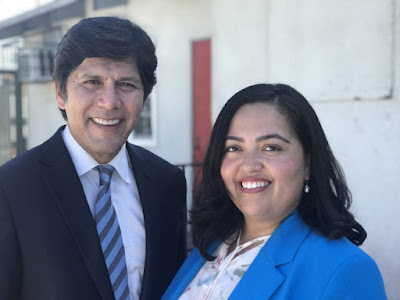 “Wendy Carrillo will make an excellent Assembly member for the people I represented in the California state Legislature,” Gomez said in a statement. “She is a proven working-class progressive who understands that she must represent everyone in the 51st District." ..........., including Big Oil, Energy, Pipeline and Timber. In the initial tally of Absentee Ballots for the 51st Assembly District Special Election, Los Angeles Community College District Board of Trustee Member Mike Fong, has a 404 vote lead over Luis Lopez .........., with Wendy Carrillo CLOSELY trailing by 92 ballots. LACCD Trustee Mike Fong (right) can smile (for now) via his early lead in tonight's 51st Assembly District Special Election. ** Blogger's Notes: DISCLAIMER ALERT!! For those few who cared to have voted in today's 51st Assembly District Special Election, PLEASE do not expect a final determination this evening regarding the CERTAIN December Runoff aspirants. 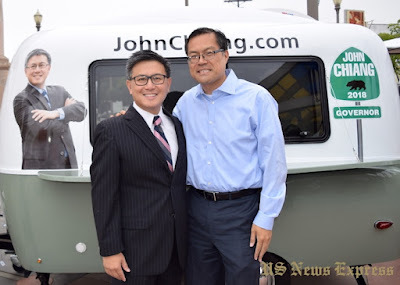 with the initial tally of the Absentee Ballots, LACCD Board of Trustees Member (and former CD-1 and Mayor Villar Staffer) Mike Fong, has parleyed his numerous community contacts .........., into a 404 lead over second place candidate Luis Lopez. But the Lopez Campaign cannot relax in being assured of a position in the December Runoff, via the CLOSE third place position of Wendy Carrillo, who only trails by 92 votes. The initial count of the Absentee Ballots, denotes a separation of Fong, Lopez and Carrillo from the rest of the twelve candidates field, with Gabriel Sandoval being the ONLY other candidate to break double-digits in percentage of votes. Thus, with the ABYSMAL voter turnout today, EVERY ballot will need to be counted in the days ahead to finalize the candidates for December's Runoff-----Scott Johnson. Our Prayers and Thoughts are with those affected by "An Act of Evil", targeting attendees of the Highway 91 Country Music Festival in Las Vegas, that has left 58 Dead and 515 Wounded. President Donald Trump will visit Las Vegas on Wednesday. 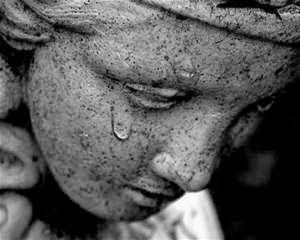 Shedding Tears for the Victims of An Act of Evil. Blogger's Notes: The ramifications of Sunday's night Las Vegas Mass Shooting, targeting attendees of the Highway 91 Country Music Festival are being felt here in Los Angeles. According to news sources, a LAPD Foothill Division Officer, two LAFD Fire Fighters and two LASD employees, were among the 515 wounded as the Death Toll reaches 58. An extraordinary account of last night's Massacre has been posted by Sunland Tujunga Neighborhood Council Member Julie Jaskel Cuddihy who was attending the weekend-long, Highway 91 Country Music Festival with her children .........., and GLADLY, they are all well. But in reading her raw, vivid (and fluid) account of the shooting and aftermath, she bares witness to a horrific act that will forever be a part of the lives of those directly affected. For those wishing to help the victims, PLEASE call your local Blood Banks and consider donating, in lieu of the fact, that mass casualty shootings can put a tremendous strain on regional blood supplies----Scott Johnson.